Many scholars have used the writings of Lucy Wood Butler in their work, but The Diary of a Civil War Bride marks the first full publication of the Butler material, which includes both wartime diary and letters to her husband. Edited by Kristen Brill, this slim volume relays "a compelling account of one woman’s struggle to come to terms with the realities of war on the Confederate home front." The diary is particularly revealing of "the attitudes and living conditions of many white middle-class women in the Civil War South." 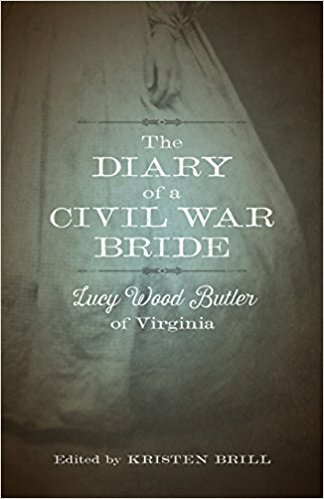 More from the description: "The Diary of a Civil War Bride opens with a series of letters between Lucy Wood and her husband, Waddy Butler, a Confederate soldier whom Lucy met in 1859 while he was a student at the University of Virginia. Serving with the Second Florida Regiment, Butler died at the Battle of Chancellorsville. Lucy’s diary spans much of the intervening years, from the spring of 1861 to the death of her husband in the summer of 1863. Through the dual prism of her personal marital union and the national disunion, the narrative delivers a detailed glimpse into the middle-class Confederate home front, as Butler comments on everyday conditions in Charlottesville, Virginia, as well as the greater sociopolitical valence of the Civil War. In addition to the details of Lucy’s courtship, marriage, and widowhood, the diary provides a humanistic and sentimental lens through which readers can closely examine broader issues surrounding the institution of slavery, the politics of secession, and the erosion of Confederate nationalism." Brill's introduction delves into Butler's background and discusses why her writings are important to Civil War scholarship. Brill also annotates the assembled diary and letters with occasional footnotes.